Find the right type of fireplace to give your home that inviting ambiance. We carry models recognized for quality, craftsmanship and elegance of design. Whether you want the snap crackle of a wood burning fireplace or the ease and convenience of a gas / propane or electric fireplace we can guide you in the right direction and explain the benefits of each. A fireplace is more than just the fire box and we can bring your dream to reality with custom stone finishes or a wood cabinet and mantels. 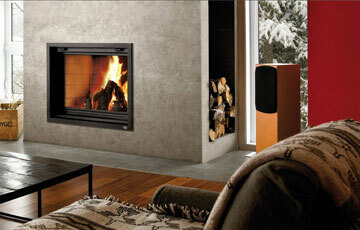 Gas fireplaces offer you the beauty of the fire without the effort of wood burning. A good alternative to chopping and stacking firewood, gas fireplaces operate with the convenience of a remote control or wall thermostat and work in a power failure! Thanks to direct vent technology these fireplaces don’t require a conventional chimney, which makes them very versatile in where you can install them. Wood fireplaces give you that nostalgic feeling, where you can hear the snap, crackle of the fire and know that you have the comfort of heat even if the power goes out. Today’s models offer you highly efficient air tight fireplaces to heat your home or stunning clean view fireplaces with low emissions to create that special ambiance. Electric fireplaces are perfect for creating ambiance without a lot of heat. You can have the flames “burning” without having the heater on so you can use this fireplace all year long. Modern fireplaces are so easy you can install them yourself, many linear electric fireplaces hang on the wall and just plug in. Ethanol fireplaces have a real flickering flame and provide easy heat without any hassle. Ethanol fireplaces give you a sophisticated contemporary look to any room in your home. These fireplaces hang on the wall like a piece of art and burn ethanol in a small reservoir inside of the fireplace. An eco-friendly fuel that does not require a chimney and creates no smell or smoke. What fireplace do you think will fit your home best? Not sure? Take a quick drive out to our Peterborough showroom and look around. See what stands out to you in person. Imagine how your new modern fireplace will look at home. Experience the warmth your new fireplace will bring to our chilly winter nights. Why choose new, modern fireplaces? Modern fireplaces are built to a different standard than older fireplaces. Whether they use gas, wood or electricity, the fuel is used more efficiently than designs even 10 years old. Some of our gas fireplaces can reach up to 84% efficiency, so 84% of the fuel expended is returned to your room as heat energy. By comparison, older, wood burning fireplaces can be as low as 30% efficient, losing heat to the surrounding walls, poor burning conditions, poor ventilation and other factors. Factors we can today almost totally eliminate. Do you require real flames? Gas or wood are your obvious choices. Do you want the sounds of a natural fire as well as the real flames? 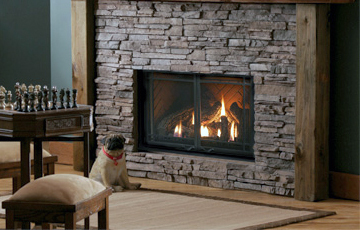 Look at our wood fireplace models. Do you want both warmth and ease of use? Look at either gas or electric. Are you space-restricted? Check out our electric models.